True Grit 100 winner Alex Grant (Sho-Air/Cannondale) leads third place Josh Tostado (Santa Cruz/Maxxis/Shimano) on the Zen section. Photo: Shelby Meinkey. 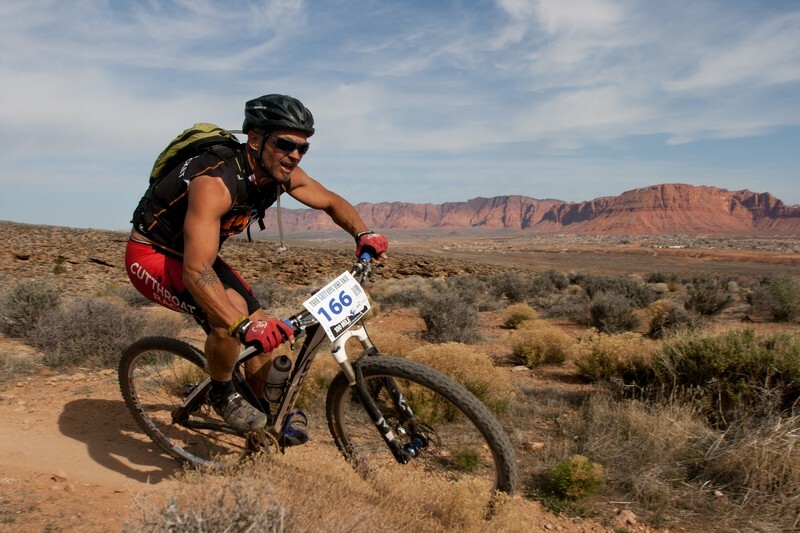 (St. George, Utah) – Two great races occurred on March 16 during the 3rd annual True Grit Epic. The 100-mile race, in its first year as part of the National Ultra Endurance Series (NUE), and the 50 mile race both drew a larger crowd this year and many pro names. 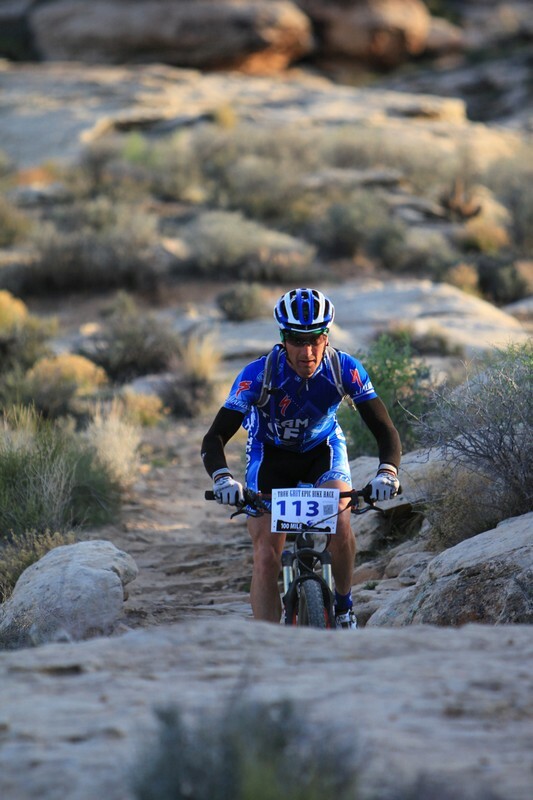 The True Grit Epic is a grueling course, especially for an early season race. The course includes almost 10,000 ft of climbing. These are not the typical extended climbs of mountain races, but short burst climbs with chunky rock that requires excellent bike handling and power. The race featured a new starting line this year, allowing the entire race to be held on dirt. 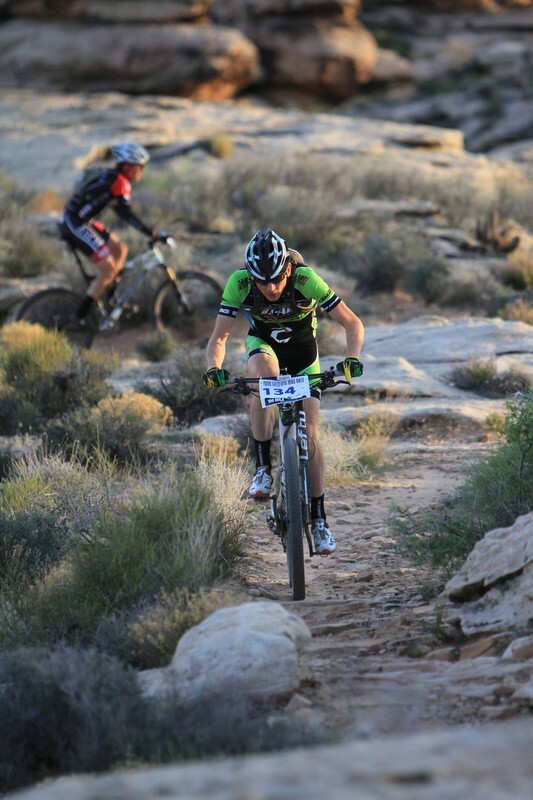 The first 25 miles uses similar trail to the Red Rock Rampage and Cactus Hugger Intermountain Cup races, but adds the Zen trail for good measure. Many people call Zen the hardest 5 miles of trail you will ever ride. It is a twisty trail of rock and canyons, with blind short drops, and steep rocky climbs. After leaving the Feed Zone at the Zen parking area, racers head to the “backside” and ride the Bearclaw Poppy trails and Stucki Spring trail until connecting with the trails in the Santa Clara River Reserve. Here the climbing and technical skills come into play again, only after racers are 32 miles into the race. Many races struggle with the 2 laps on the Barrels Rolls trail, before heading down Cove Wash and the sprint for the finish. This year’s race was particularly challenging as the temperature topped 80 degrees. Second place Cary Smith (Team CF). Photo: Shelby Meinkey. The 100-mile race saw 53 racers star, compared to 14 in 2011. Right out of the gate there was fierce competition between local Utah Racer, Alex Grant, Colorado’s Josh Tostado, and Cary Smith, the 2012 winner. They rode neck and neck for the first 25 miles, but by the Barrel Rolls section, Alex had found his opportunity to pull ahead and never looked back. 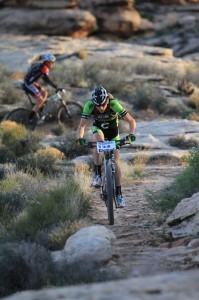 He took the win, his second at True Grit (Alex took first in 2010 in the 50 mile race). In a post-race interview he stated he had to win the NUE Season open because it was his home turf and was an important goal for the day – “Can’t have any out-of-staters taking the title.” Alex finished in 6:41:37, setting a new course record. The Women’s 100 Category was the only category of the day that had 100% of the riders finish. The women were tough; overcoming dehydration and mechanical issues to complete a hundred miles on such a demanding course. Pennsylvania’s Cheryl Sornson took the win in this category. Cheryl was the overall NUE Series winner for 2012, and her victory at True Grit, racing it virtually sight-unseen, is a testament to her talent as a racer. Cheryl finished with a comfortable 30-minute gap over the next racer. 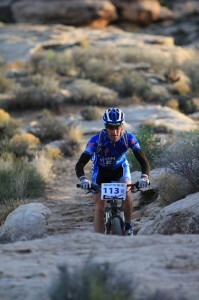 Kenny Jones (Cutthroat Racing) finished the 100 miler in the single-speed category. He is shown here on the Barrel Rolls section. Photo: Bryce Pratt. The 50 Mile race also saw fierce competition, with Rotem Ishay (Durango, Colorado) taking a strong lead right out of the gate. Rotem said he decided to race True Grit only days earlier rather that race the AZ 40 and barely squeaked in before the final registration cut-off. A group of three racers had the clear front spots until a mis-direction from a well-meaning volunteer caused them to skip the second required lap of the Barrels Rolls and finish with only 44 miles. This could have been a serious blow to the race, but as the first racers to complete 50 miles rolled in, all the racers got together and presented a solution that was a win-win for everyone, with the front runners receiving the cash purse and the 50 mile finishers taking the title and additional prizes, essentially sharing the podium. Jen Hanks, from Salt Lake City, took the victory in the women’s 50-miler category. This is particularly inspiring as Jen is a breast cancer survivor, and had to dig deep to beat out second place Erin Swenson by just 55 seconds.